Nectria canker is a fungus disease caused by Nectria galligena. Occasionally, it is found on apple nursery stock shipped into the eastern United States; however, the economic effects of the disease in the region are minor. Figure 1. Nectria cankers on trunk of 'Delicious' apple. Photo: Alan L. Jones, Michigan State University. The fungus grows deep into the wood and kills new wound callus as it develops. This annual killing of successive layers of callus results in perennial, target-like, zonate cankers (fig. 1). Eventually the cankers girdle the tree, resulting in a dieback of infected limbs or trees. 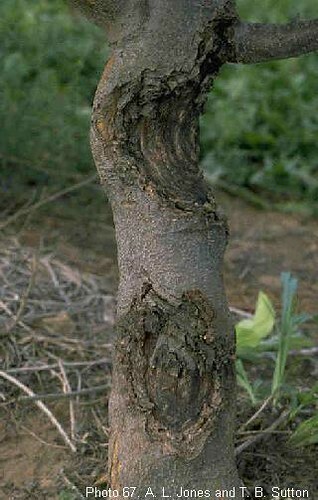 The cankers are sometimes visible on the trunks of nursery trees at the time of planting, although latent infections can appear later in the season. To control for this condition, carefully examine nursery trees purchased from the western United States and Europe for symptoms of the disease. Return trees with cankers to the nursery for replacement, or discard such trees.